w/childcare fun and faith activities! The couples retreat is a beautiful opportunity to grow in your friendship with the Lord and closer in your marriage. The day will be filled with discussions about prayer as taught by the various Doctors of the Church. You and your spouse will encounter Christ through prayer in hopes of deepening your loving relationship with God and in your marriage. Bring your children for free activities and childcare for any age. Mass, confession, and lunch are included. All are invited to stay afterwards to enjoy Camp River Ridge grounds, lake, swimming/canoeing and social. Attendance is by free will donations. Please contact Lisa Weisbrod for registration at (513) 515-8489 or email leweisbord@gmail.com to ensure enough materials and catering for lunch are available. **Kids will follow a different schedule, but eat at the same time. 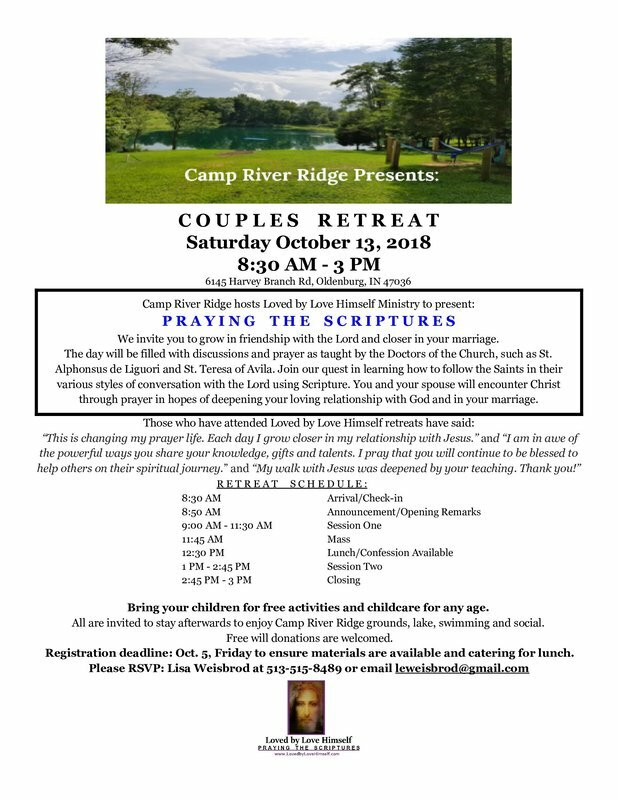 For more information, please contact the camp director at campriverridge@gmail.com. © 2017 by Camp River Ridge.